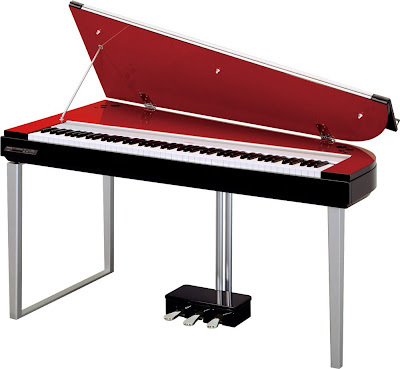 A stunning, new digital piano featuring a sophisticated style that accounts the finest living environments. The H01 combines true piano sound in a modern, attractive cabinet that evokes the beauty of a real acoustic grand piano - adding sophistication and musical expressiveness to your living space. And it sounds like a traditional Grand Piano! A Futuristic appearance, supreme sonic power and audio quality combined with meticulous attention to detail will ensure that will make a high – impact , perhaps even controversial entry into a rather reverential and conservative marketplace. Inspired by the Slimline Clavinova, the MODUS H01 digital piano also offers outstanding sound quality and space-saving consciousness with an even more eye-catching modern appeal. Yamaha designers have addressed the needs of luxury homeowners, who put a premium on efficient use of space and enjoy adorning rooms with stimulating accents that make their homes unique and sophisticated. The MODUS H01 comes in a variety of gorgeous finishes, including Amber Glow (H01AG), Velvet Rouge (H01VR) and Deep Brunette (H01DB), all accented with polished ebony.